Dear reader in our last post we have discussed about existence clay soil having high plasticity in foundation and embankment itself and their contribution in sliding type dam failure. Our discussion, here, is also related to this topic; but we will discuss this relation to grain size. A study was conducted over 65 dams in western part of United States; most of them were old homogeneous dams. The D50values of soils that were used on construction of these dams in essentially their impervious section were collected to make a correlation with grain size and sliding failure. The D50 values were found ranging from very finer like as fine as less than 0.005mm to coarser materials of greater than 2.0 mm. 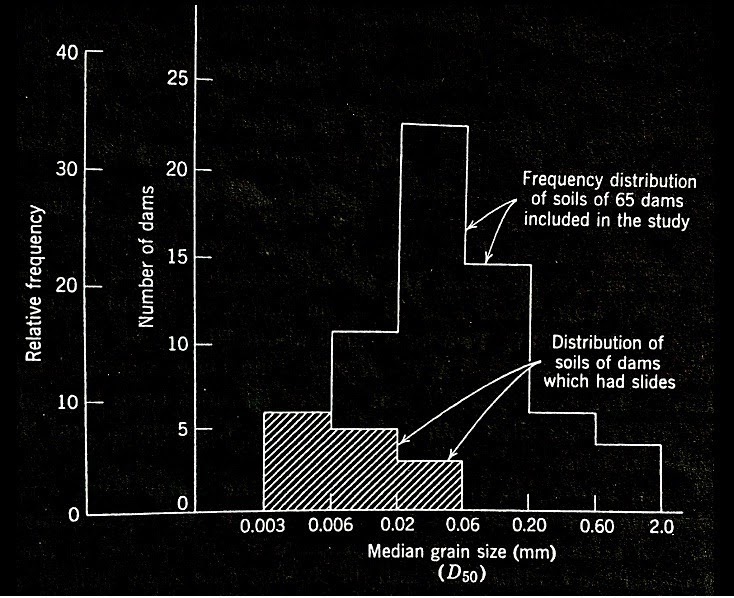 Here we are providing a figure depicting relationship between average grain size of soil and occurrence of sliding. a. All embankments constructed with clay having average value of grain size (D50) finer than 0.006 mm, suffer sliding failure. b. Half of all embankments constructed with clay having average value of grain size (D50) ranging from 0.02 mm to 0.006 mm (approximately), suffer sliding failure. c. Small fraction of embankments constructed with soils having average value of grain size (D50) ranging from 0.02 mm to 0.06 mm, suffer sliding failure. d. None of embankments constructed with soils having average value of grain size (D50) coarser than 0.06 mm in their foundation suffer sliding failure. Even though there have steep slopes and worst combination of poor compaction.